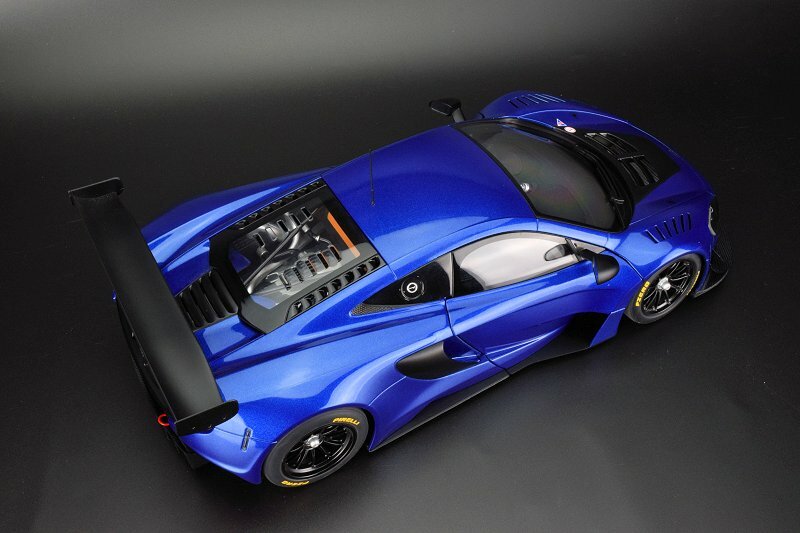 When it comes to scale models, it seems the supercar is the leader in terms of overall excitement. 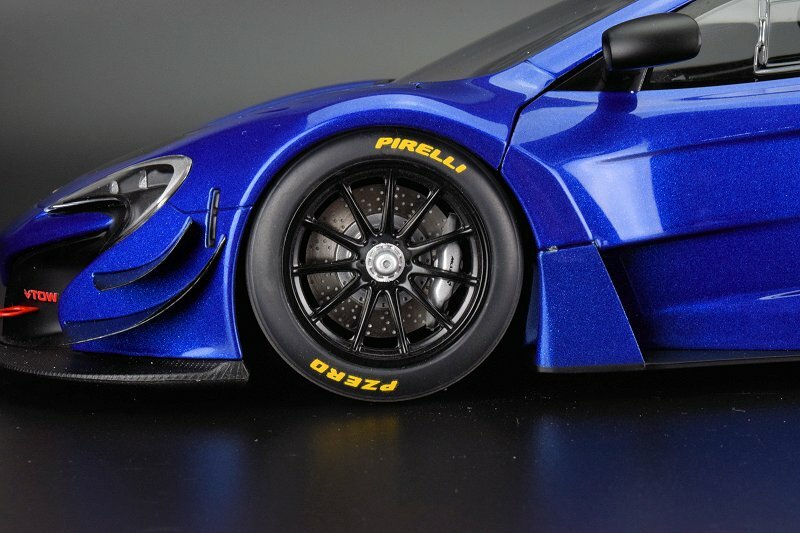 And our DiecastSoceity.com team fabric is definitely in agreement. 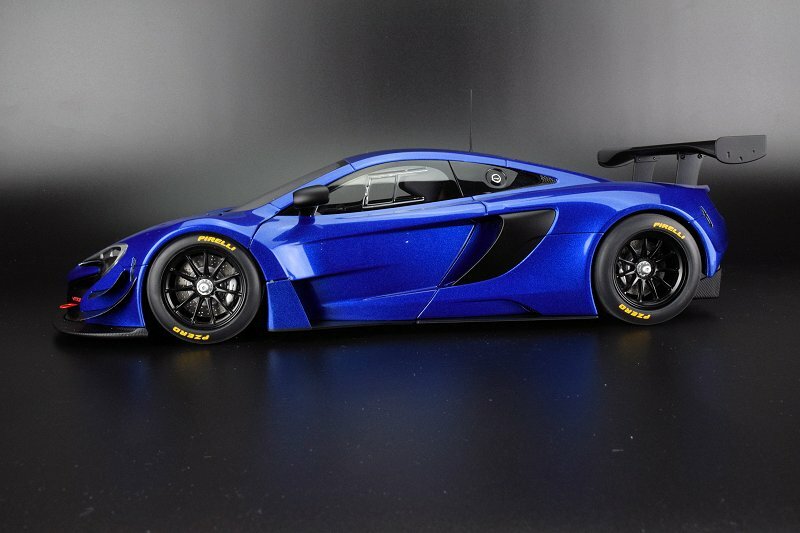 One of the latest releases from AUTOart features the McLaren 650s GT3 in 1:18 scale. 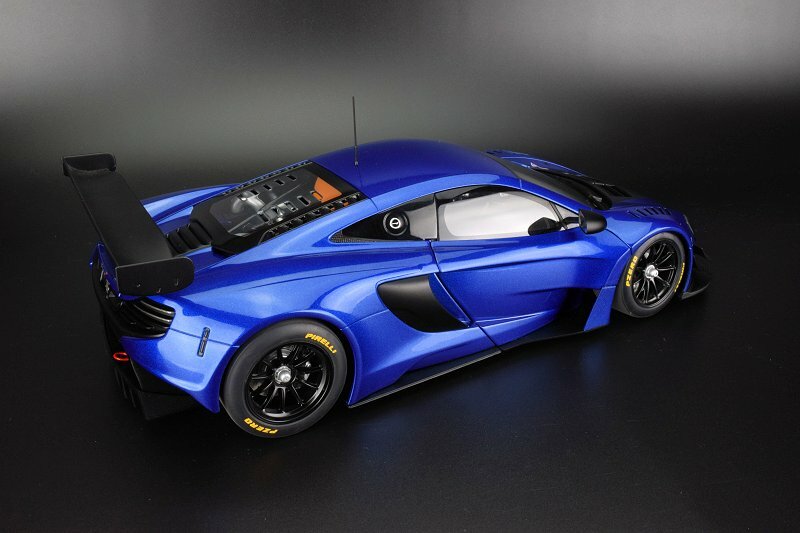 This is a race ready car direct from the McLaren factory. We like to reference them as the non-livery or presentation examples. 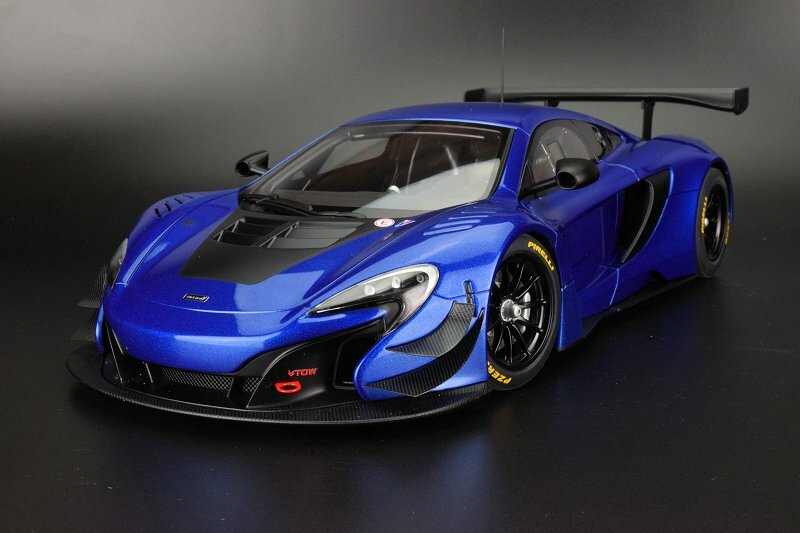 Suggested retail on the McLaren 650S GT3 is around $199 CND. 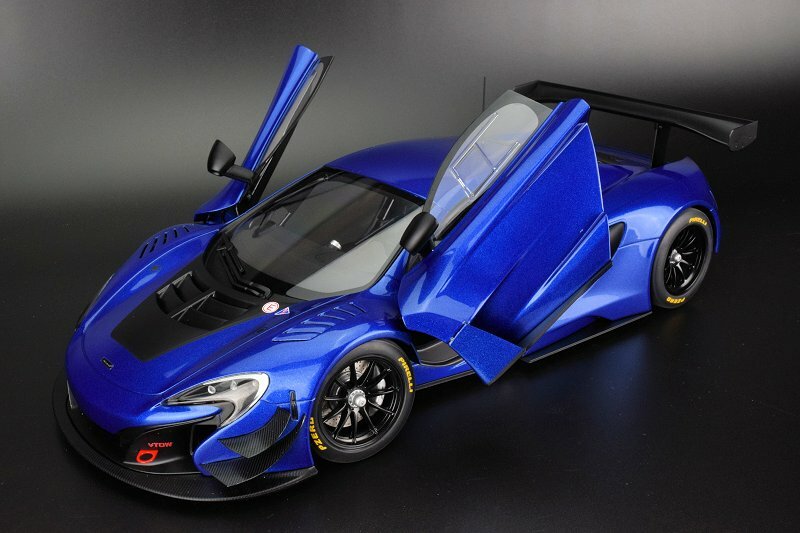 The model comes from their composite and diecast series, which means the interior skeleton is mostly diecast and the exterior panels are composite base material. 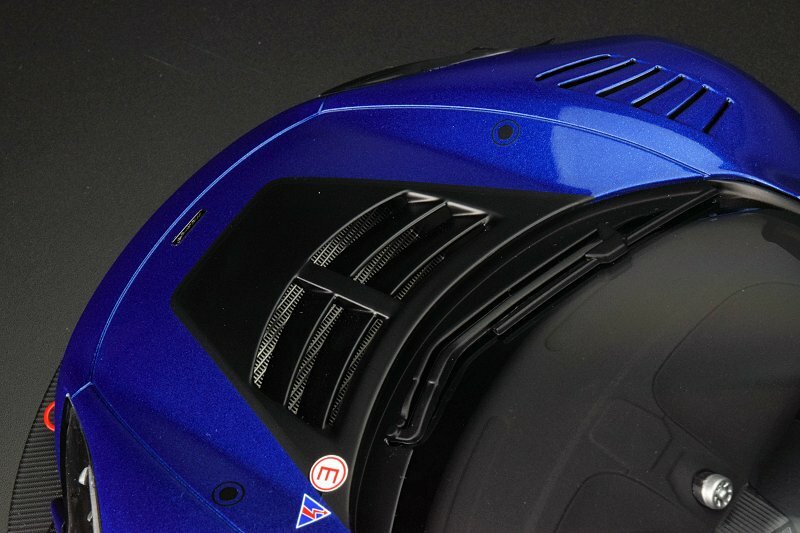 We went with the exterior colour Azure Blue with Black accents – in our opinion the sexiest and the evilest of the bunch! There are other colours available, select the “News by Brand” link on the main page to see photos of more available colours. The paint is fabulous on our example. No flaws to mention at all. 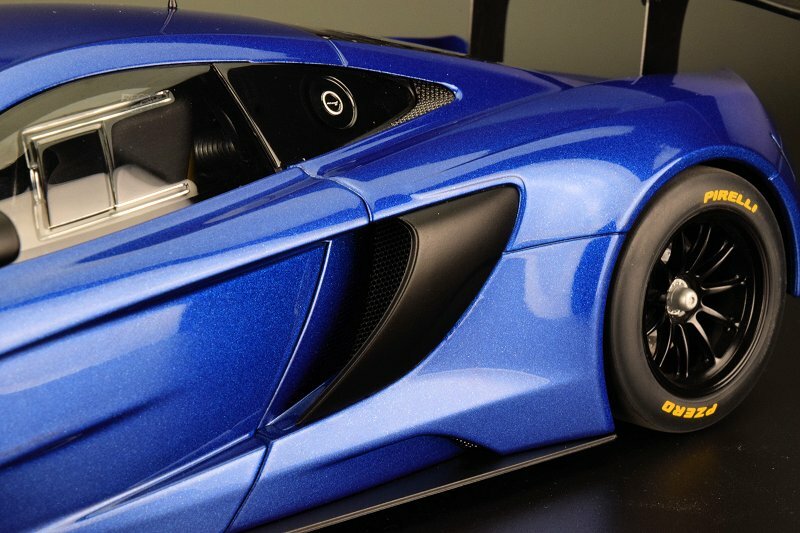 AUTOart has definitely improved with the paint on the composite exteriors. 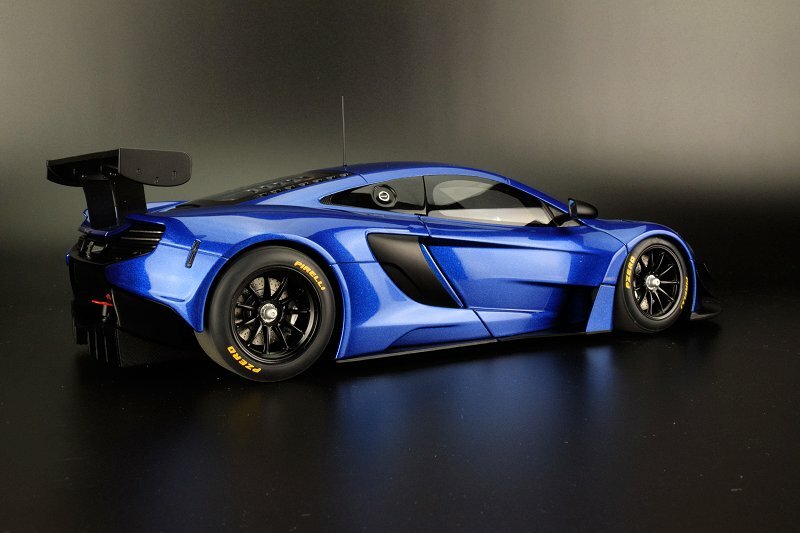 The overall shape and lines of the 650S GT3 are nicely captured. We not sure if the model here is based on the 2015 or 2016 platform. 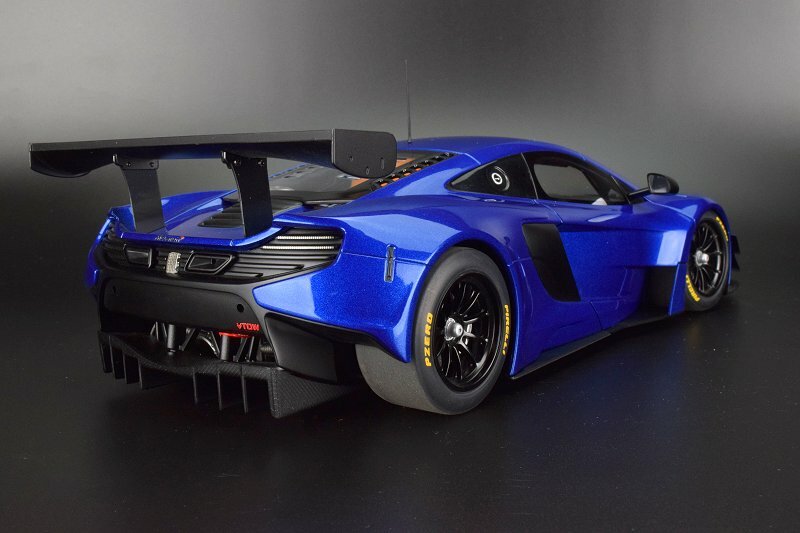 We mention this because they are slight aerodynamics differences between the two; the most obvious is the make-up of the aerodynamics within the doors. 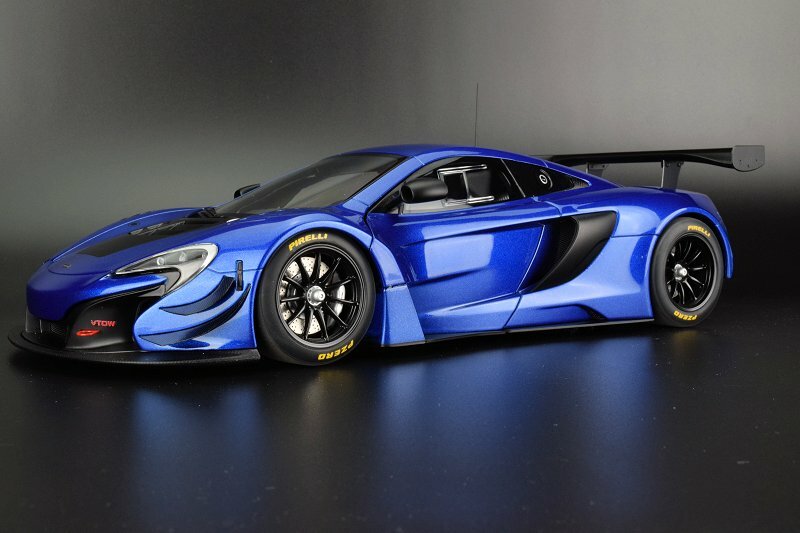 The AUTOart example leans towards 2015. One exterior element missing is the hardware fastening the lower portion of the front section of the doors. Also just above on the hood, there should be a locking fixture too. 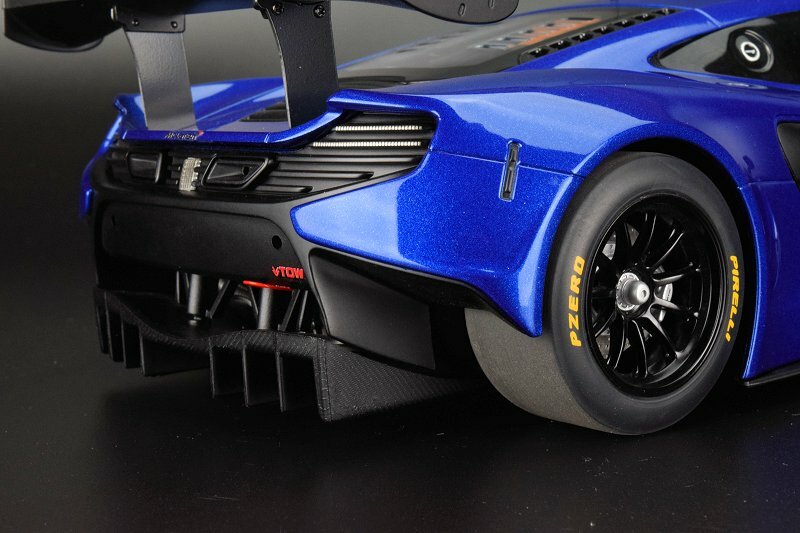 However, AUTOart did include the strapping hardware front and rear. 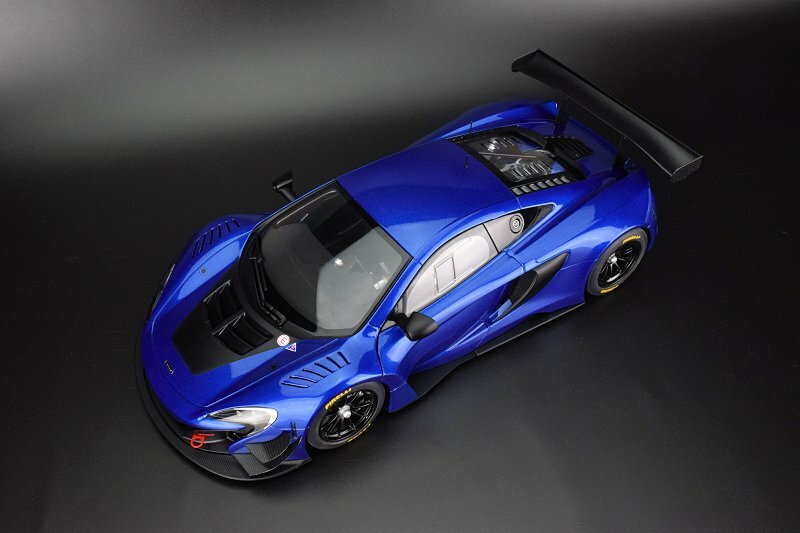 Moving to the front you’ll see it is dominated by large carbon fibre chin spoilers and two carbon fibre fins on either side. 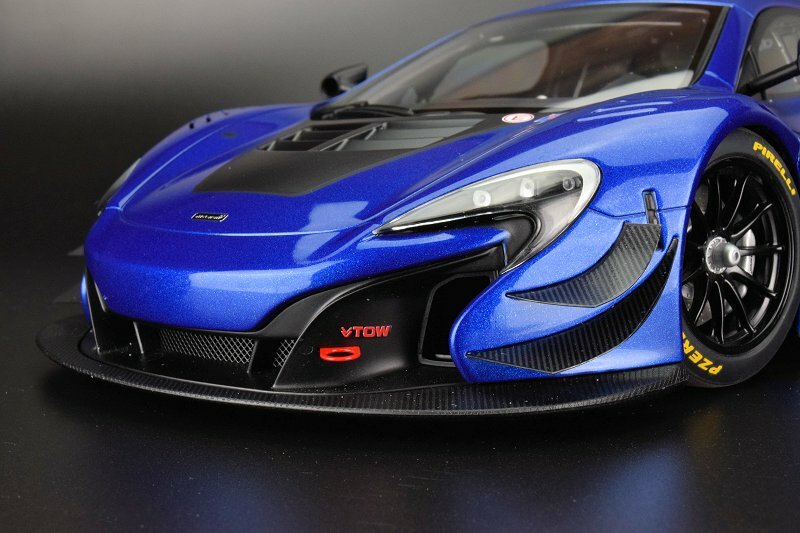 There are always complaints about the collector community about AUTOart’s technique of moulded carbon fibre. In this case, the reproduction isn’t too bad but nowhere never perfect. However, you don’t see the raw hardware on the fins that attach them to the body. No access to the front section either. 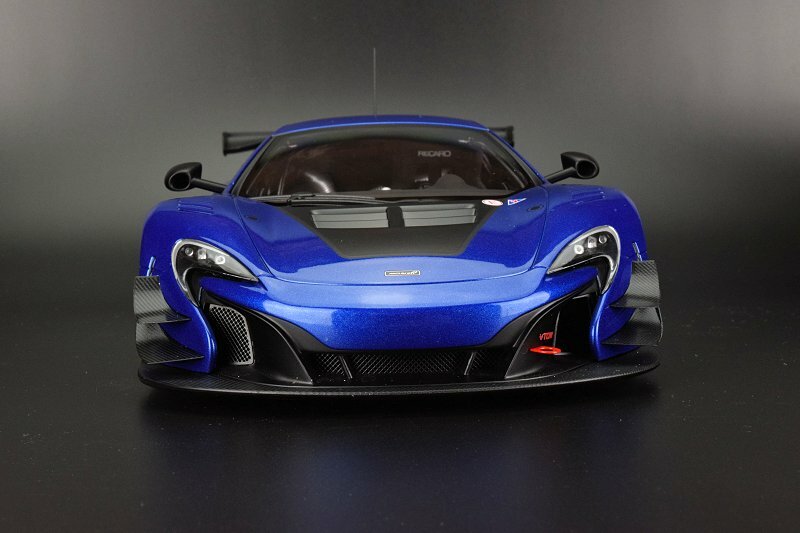 If this is important, look into the line of McLarens coming from Almost Real. 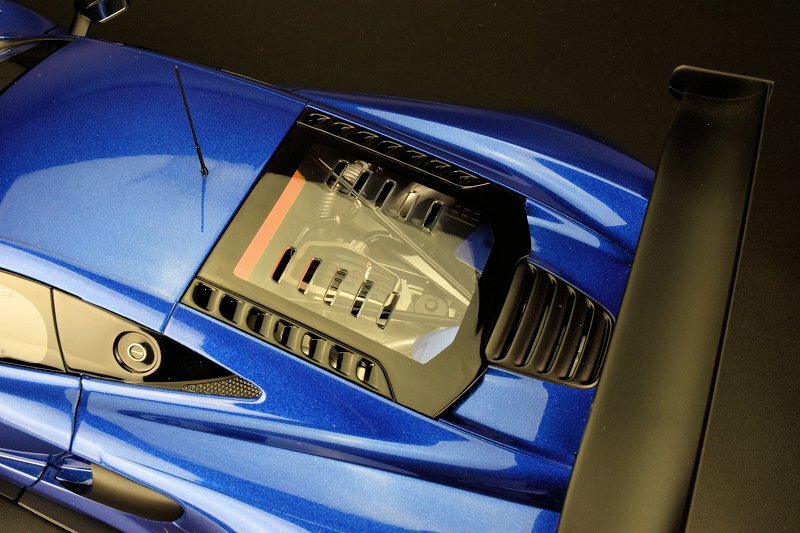 Good use of perforated grilles on the lower centre and side intakes, however, our example is missing the right grille! 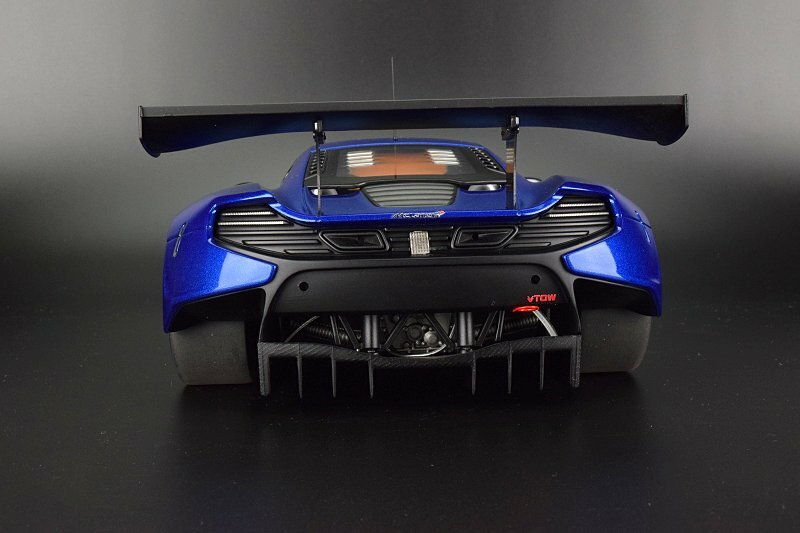 The rears lower diffuser is completed in the moulded carbon fibre, the make-up definitely doesn’t align with the original. The large upper grille is completed with a solid piece with recessed lines that mask as the finished grille. The original car features perforated grille to aid in cooling. 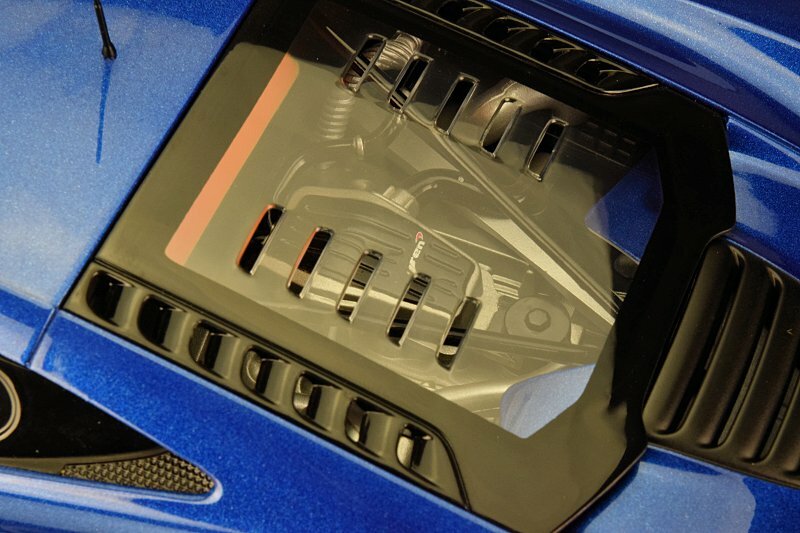 Lastly, the detail on the engine and transmission detail that is shown in behind is somewhat crude for an AUTOart piece. The motor is visible through the transparent cover but we have no physical access to with hinged or removable panels. The motor detail itself is decent but definitely not on par with older models from the brands. It lacks the imagination and realism, somewhat too plastic and flat for our liking. Wheels are a strong point on this model. Quality cross-drilled rotors and Silver calipers are nicely executed. Black paint and overall design of the rim is well executed too. Note the Pirelli script around the perimeter, nice touch! Interior has complete access. Gulling style doors on our example were flawless in operation. Small magnets on the body help keep everything in place. We do like the overall presentation of the interior, all elements are touched. Nice work on the single driver seat with textures and colour. 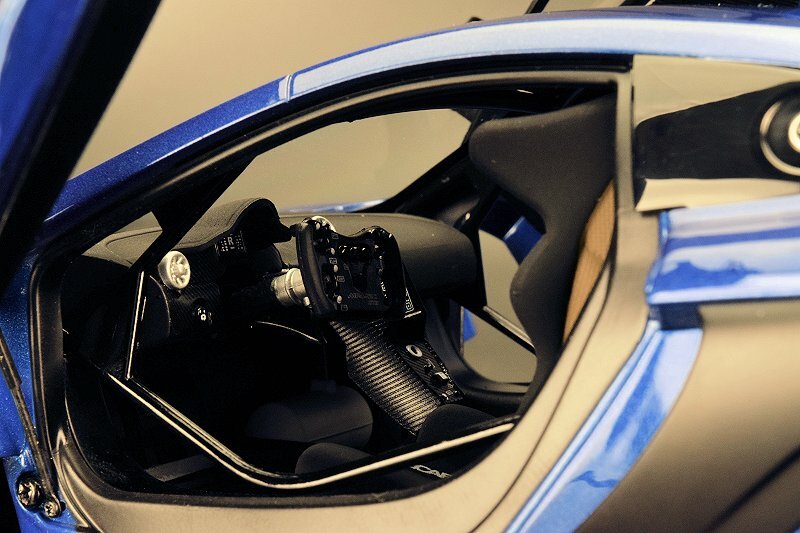 On the flip side, the interior isn’t up to speed with materials and textures as with AUTOart models of the past. The rubber used for seat-belt hardness is very poor. 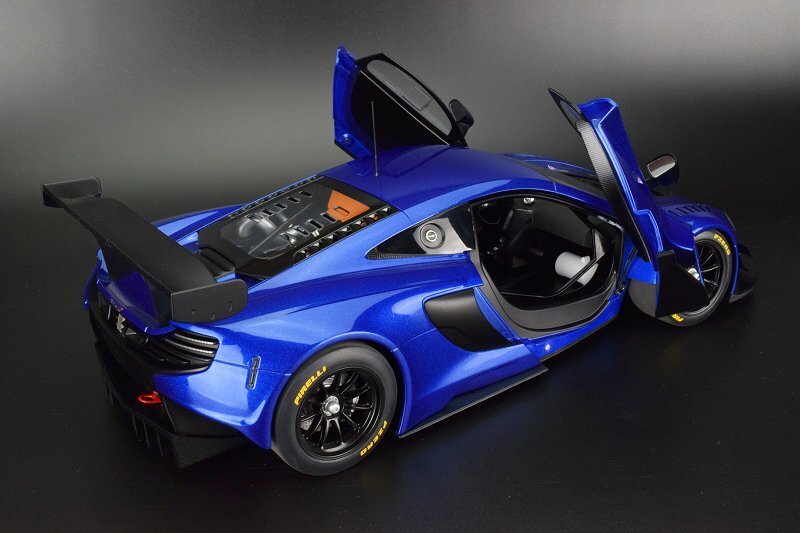 The ugly executed pedals are cheap looking and out of scale, WTF AUTOart? 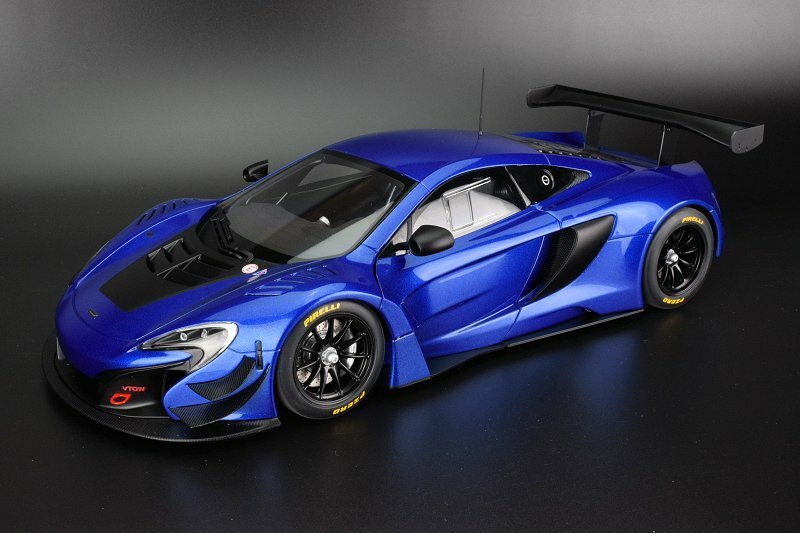 AUTOart’s McLaren 650s GT3 gets an overall rating on this one is a B-. The model definitely does show well, the paint does provide the added punch. 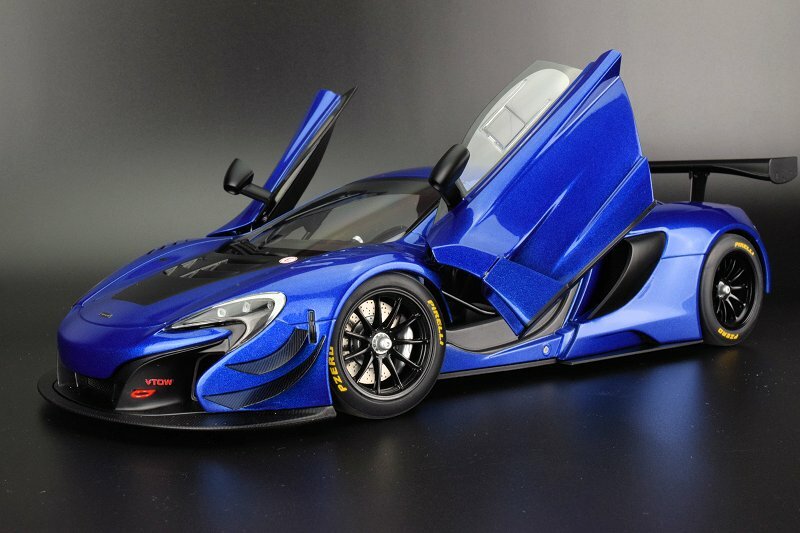 Yes, we do understand that this is the opening price point AUTOart, but retail here is at the $200 mark. The cost-cutting misses are starting to get old. It is obvious the team is looking for costing out to maximize return. 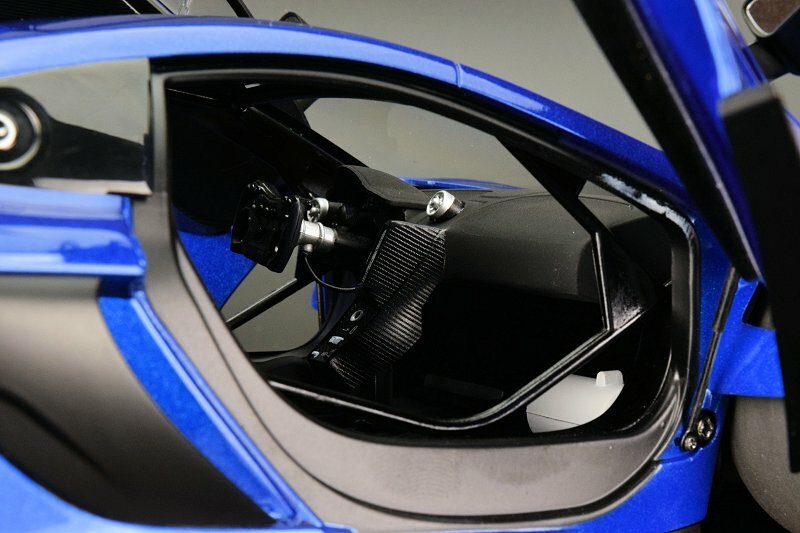 But in all honesty, what would it cost to use fabrics, use better carbon fibre techniques, interior elements are to scale and execution is at least aligned with the overall piece? 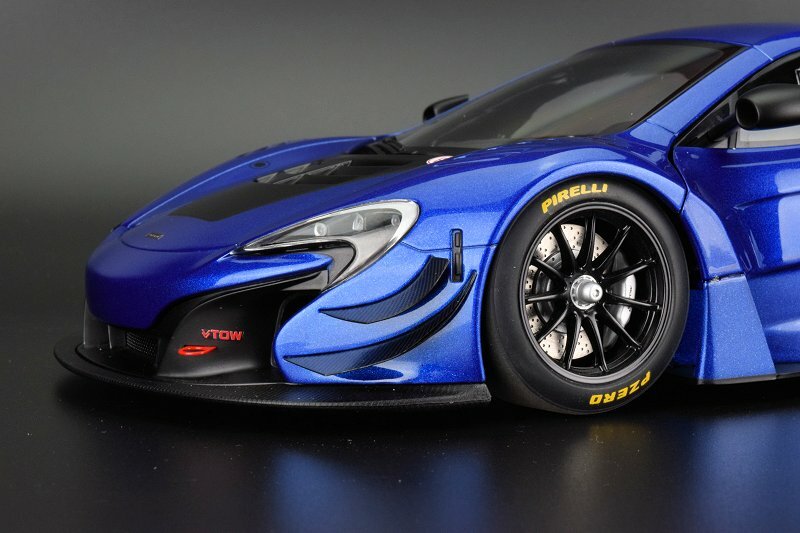 AUTOart you haven’t made friends with the switch to composite from diecast metal. The promise was to aid is cost and still provide a solid foundation, well it seems you’re making ground with better executed composite bodies but the finer details are not the priority and it shows. Enjoy the pics! 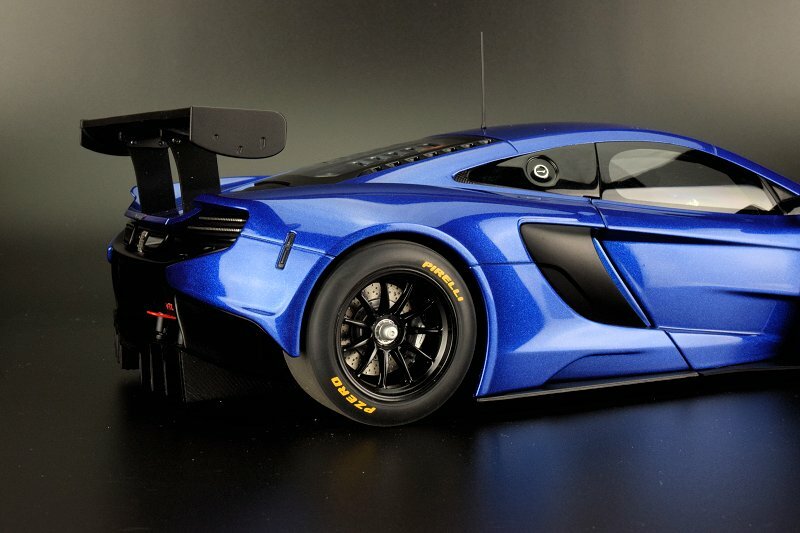 7 Responses to "REVIEW: AUTOart McLaren 650S GT3"
CompoSHIT, lower quality details again… NO BUY. Regarding review pictures, lighting a little too dark, and images not as crisp as offered previously. I also think the dark backgound is a bit too dark at least for dark cars. The images were still on the SD card, we adjusted slightly. Enjoy! Good review DS Team, and detailed pictures. Very appreciated! I appreciate the evaluation with letter, B- in this case. It pretty much represents what I felt when reading your review. IMO, the model as it is should be offered in the area of 150 or 160$ CAD. Then, at this quality/detail level, it’d be interesting. But, at 200$, this is not for me. Nice review as usual. I agree on the paint. It looks like they have figured out how to get a nice paint finish on the plastic. Otherwise, pretty disappointing model. I had the Bathurst Winner variant on my wishlist but I am not sure it will remain. If the cost was a bit lower to reflect the lower quality in the small details it would be a bit easier to decide. I don’t think it’s worth the MSRP as is. 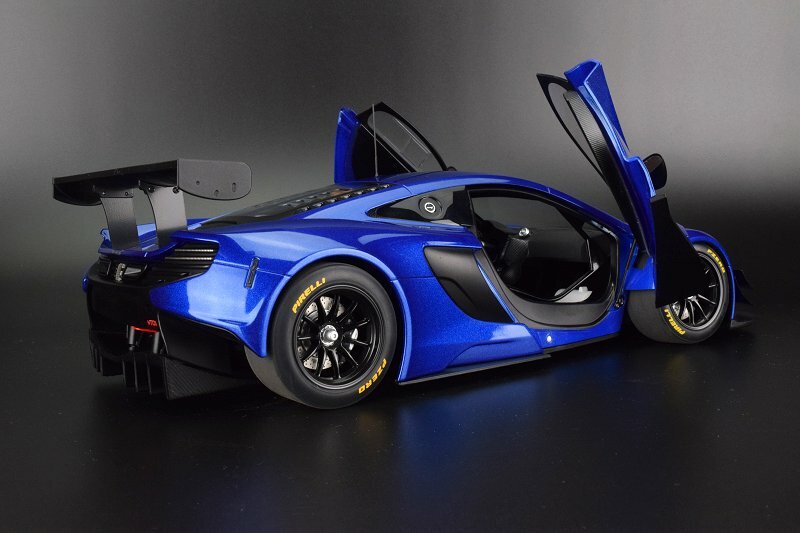 The most disappointing thing is how great their MP4-12C GT3 models are then seeing how lazy they got with this. How the mighty is falling.